Family Law Newswatch have at last completed the re-design of their website, and a pretty good job they seem to have done too. 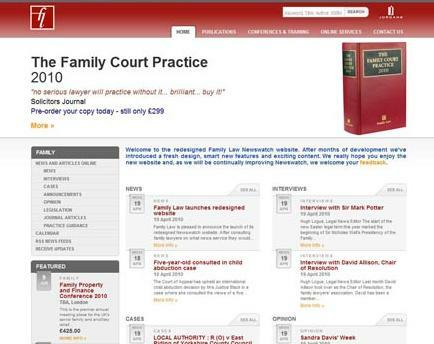 The new site includes sections for news, interviews, cases, legislation, articles, practice guidance and even a Family Law Calendar. There is also an Opinion section in which renown family lawyers such as Sandra Davis and Andrew Woolley give their views (quite where Andrew Woolley finds the time to do this, blog and run a firm, I don't know). Best of all, the site at last contains feeds to its various sections, although one overall feed would have been useful. All in all, the new site is a vast improvement, and definitely worth a (regular) visit. 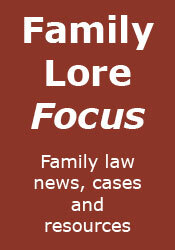 All important updates on Family Law Newswatch will, of course, continue to be included in Family Lore Focus.